The island of Ternate was a major regional center in the Portuguese and Dutch spice trade for several centuries, which is the main reason the historic activity of Gamalana volcano is so well dosumented. Eruptions, recorded frequently since the 16th century, typically originated from the summit craters, although flank eruptions have occurred in 1763, 1770, 1775, and 1962-63. Some eruptions such as in 1771, 1773, 1775, 1838, 1871, and as lately as in 1962 caused fatalities. Gamalana has 9 craters: Arfat Crater, Madiena, K1, K2, K3, K4, Laguna Lake, Tolire Jaha and Tolire Kecil. 3 cones, progressively younger to the north, form the summit of Gamalama volcano. Several maars and vents define a rift zone, parallel to the Halmahera island arc, that cuts the volcano. 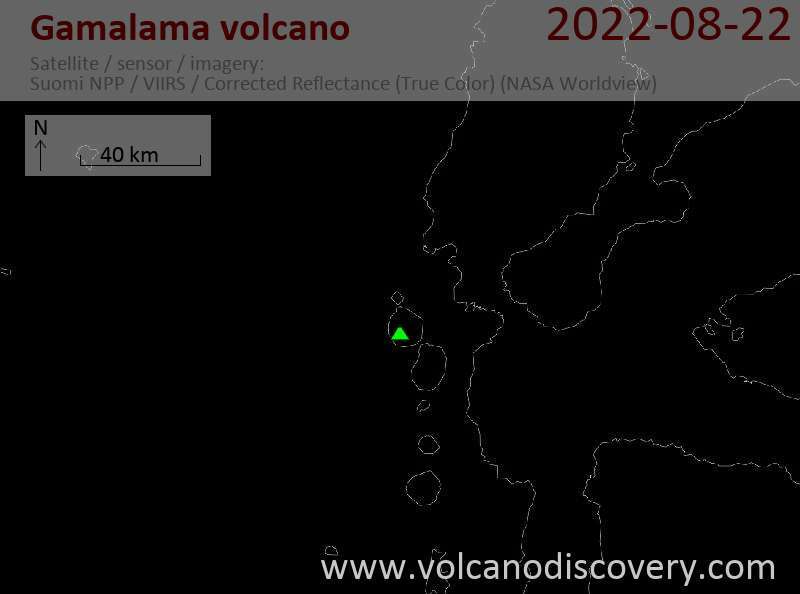 Seismic activity increased at Gamalama volcano beginning 20 August 2007 and a few days later, there was a small eruption. On 23 August, white and gray plumes rose to an altitude of 2.1 km. Authorities banned access within a 2-km radius of the active crater. Activity continued into 2008 with weak occasional ash and steam emissions. On 11 May 2008, CVGHM reported that emissions from Gamalama had risen to higher altitudes during the previous two days. On 10 May, white-to-gray plumes rose to an altitude of 1.8 km and drifted N. On 11 May, white plumes increased throughout the day from 1.7 to 2.2 km altitude. On 31 July, a series of strong explosions occurred, producing ash plumes up to 2 km above the crater. A pyroclastic flow traveled down Togorar valley on the NE flank of Gamalama volcano. On 1 August, ashfall was 1-3 cm thick in the E part of the island and some of the local population was evacuated. Ternate town ca. 7 km east of Gamalana was covered with thick ash. There were no reports of casualties or damage. Ash explosions continued until October 2003. An unusually powerful and sudden eruption occurred on 5 August 1994 at 21h25 local time, producing an ash cloud reaching 3 km above the summit and strong ash fall in nearby areas. An aviation warning was issued for the area. A felt earthquake a few minutes before the eruption had an intensity of MM II-III. Smaller eruptions happened in the following days and weeks, such as on 14 August when there was ashfall in Ternate. The frequency of eruptions in this period was 5-20 minor explosions/day. Gamalama volcano eruption on 12 February 1988 caused ash fall over Ternate Island and the evacuation of 3000 people. A strong eruption was reported on 9 August at 04h45 local time. A thick black eruption column containing incandescent material rose 1.5 km and caused a pyroclastic flow traveling down the N flank, destroying homes and plantations. Ash fell W of the volcano, closing the local airport of Ternate. Explosions on 10 August produced 1.5-km ash columns. More than 5,000 persons living near the volcano were evacuated. No casualties were reported. Gamalama Volcano started erupting on 4 September 1980 ejecting incandescent tephra and glowing bombs to up to 1 km distance. A new crater was formed on the ENE side of the summit.